"Excellent" caliber businesses are growing and expanding, and constantly moving beyond comfort zone to adjust to changing technology and market conditions. How do we move from "at–risk" to "excellence"? These companies are always improving their present situation—and always looking forward. 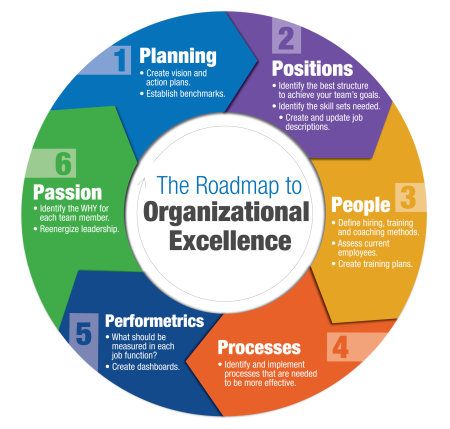 For leaders, and everyone else at these organizations, excellence is a way of life. These organizations are nevertheless vulnerable, because they have not yet created a management culture in which organizational excellence is second nature, regardless of personnel changes. These businesses are doing well enough to reasonably satisfy the owners and management, but they are vulnerable to regressing back to the at-risk level . These businesses typically revolve around their leader, without this leader the business or department may suffer greatly. The Leadership for Organizational Excellence model makes Organizational Excellence the basis of your company’s long-term growth plan. The program, which has been tested and proven in multiple industries, works because it is a sequential, continuous, repeating process. The heart of this powerful leadership model is known as the 6 P’s. What does excellence look like in action? What are you personal priorities? Does your vision for the business support priorities? What are your top three Key Priorities? What is the ideal organizational chart? What should the job description say? What attitudes and habits do you not want in the organization? Which employees will fit in immediately? Which current employees might fit with some development? How do you recruit, hire, and retain talented people? What processes need to be updated? What processes need to be created from scratch? How should you document best practices into clear processes ? What kinds of tracking reports and dashboards should you use? How should you build performance metrics into specific job descriptions? How should you conduct performance appraisals? What will make the journey toward excellence a way of life? How do you sustain the energy and the drive needed to grow the business over time? How can you share your passion for what you do to motivate others? 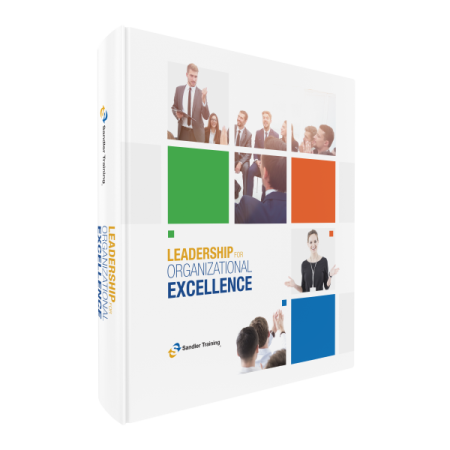 Sandler's Leadership for Organizational Excellence teaches you how to master and implement best practices that will turn your personal Vision for your company, and yourself, into a reality. This program sets you and your company on the road to Organizational Excellence... and keeps you moving forward.